Summer is basically right around the corner, which means it’s time to transition your wardrobe, your coffee habits, and your beer. While you’ll have to tackle the wardrobe yourself Marie Kondo-style, Harpoon and Dunkin’ have taken some of the guesswork out of the coffee and beer transition -- by combining the two to make an all-new summer ale. The New England beer company just rolled out the new beer -- Harpoon Dunkin’ Summer Coffee Pale Ale -- just ahead of rooftop drinking season. The 5% ABV beer combines the tang of hops and “a bright, summery pale ale” with Dunkin’s signature Iced Original Blend Coffee, according to a press release. While it may taste like iced coffee and be similarly refreshing, maybe don’t replace your morning coffee with the stuff, OK? 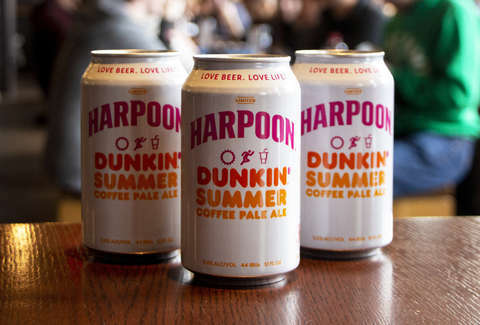 This is Harpoon’s second collaborating with Dunkin’, but the first time the pair have put out a summer-centric beer. The last collaboration between the two companies was in October 2018, when they put out a Coffee Porter for fall. The marriage between these two companies seems like an obvious one, considering how much people from New England love Dunkin’. Harpoon’s co-founder and CEO, Dan Kenary, added, “I just depleted the last of my private stash of Harpoon Dunkin’ Coffee Porter the other day, so selfishly, the timing on the launch couldn’t be better.” He went on to say that the company was “excited” about this new venture, and that, at least in his opinion, the beer is “delicious.” You’ll either have to take his word for it, or try it for yourself. As for where you can find Harpoon and Dunkin’s Summer Coffee Pale Ale, the beer will be available in 12oz cans and on draft at select retail locations across the Eastern United States from now through the end of summer. Sorry, West Coast. We understand that’s pretty vague, so Harpoon has created this handy dandy little tool to help you find their beer near you. Technology is truly a gift sometimes. Now you’ll have Dunkin’ iced coffee to get you through the day, and Harpoon Summer Coffee Pale Ale for those warm summer nights. Cheers to that.